Do you like to record your life experience? Do you like to edit your own movies? Then, you must hope you could easily handle your videos with some hottest Apple softwares such as iMovie, iDVD, Final Cut Pro, and Final Cut Express etc. But those softwares don't recognize all popular media formats, but limited to QuickTime compatible formats, a.k.a MOV, MP4, M4V encoded by Apple only. Fortunately, with ProRes Converter, you can remove all those limitations. The best part is that ProRes Converter supports professional encoders like Apple Intermediate Codec, ProRes to ensure maximum editing quality and efficiency when working with Apple softwares. Apple ProRes is one of the most popular and commonly used codecs in professional post-production. All members of the Apple ProRes family provide an unparalleled combination of multistream, real-time editing performance coupled with impressive image quality at reduced storage rates. Specifically, ProRes Converter supports ProRes 422 and 4444 input formats and ProRes 422 output format. With it, you can convert all popular media formats to Apple ProRes 422. Then you are able to import them into the hottest Apple softwares. Now let’s walk over the detailed steps. Step 2 Launch ProRes Converter, click Add Video/DVD button to add files or drag files directly into the program. Step 3 Click Profile drop-down list. In “Apple Software”, please choose the output format for relevant Apple software. Tips: Take iMovie as example, there are iMovie ProRes (.mov) and iMovie (.mp4). But iMovie ProRes is preferred. Step 4 Please click the "Profile Setting" button to customize the parameters according to your need. Step 5 Click "Convert Now!" button to convert to Apple ProRes 422. Apple ProRes is Apple's professional video codec. It compresses video very mildly. It's a kind codec, visually lossless across many generations. In the video industry, it's called an "intermediate" codec, which means that it is optimized for capturing and editing video. All members of the Apple ProRes codec family support frame sizes up to 4K as well as SD, HD, and 2K at full resolution. 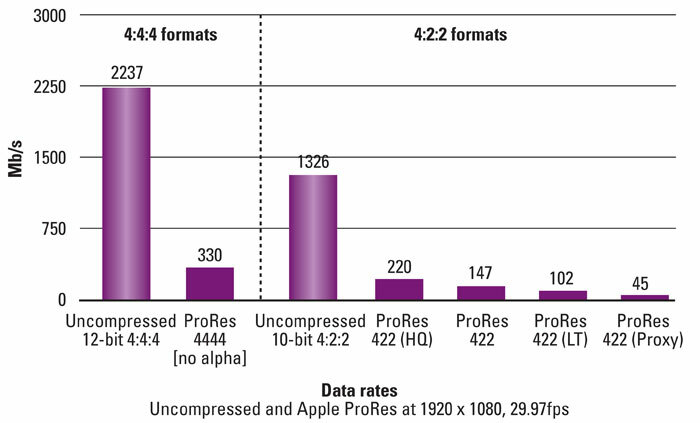 The data rate of Apple ProRes varies based on codec type, image content, frame size, and frame rate.